From knives, shovels, axes and pitch forks, the typical weaponry associated with refugees, to F-16 fighter jets, Iron Dome missile defense systems and Nuclear Warheads, those resilient Israeli Defense Forces (IDF) have managed to defend a nation that for all intents and purposes should have been wiped off the map a few decades ago. Coming out of 1,878 years of worldwide dispersion and the holocaust, the Jews have managed to muster up a mighty military machine that in just seventy-years now threatens to send Iran’s nuclear program back to the “stone- age”. According to an ancient prophecy in Jeremiah 49:34-39, that may be what’s about to happen. Around 596 BC, the prophet Jeremiah predicted a future time when Iran would experience and epic disaster. Details within this prophecy suggest that the calamity could be from a military strike that creates a nuclear disaster. I explore and explain these details in my book, Nuclear Showdown in Iran, Revealing the Ancient Prophecy of Elam. (Watch the Official Trailer for Nuclear Showdown in Iran). Was Israel’s current military prowess predicted to happen in the Bible? The answer to this question appears to be yes, and that an even more powerful, an “exceedingly great,” IDF is soon forthcoming. What we witness today with the IDF, which is presently the #1 ranked army in the Middle East, is the development of what the Bible foretells will become an “Exceedingly Great Army” according to Ezekiel 37:10. Then He said to me, “Son of man, these bones are the whole house of Israel. They indeed say, ‘Our bones are dry, our hope is lost, and we ourselves are cut off!’ Therefore prophesy and say to them, ‘Thus says the Lord GOD: “Behold, O My people, I will open your graves and cause you to come up from your graves, and bring you into the land of Israel. These passages clearly evidence that these bones represent the “whole house of Israel.” Furthermore, it pictures the Jews in a desperate condition. Their “hope is lost”, and they “are cut off.” Lastly, they are being restored “into the land of Israel,” meaning they were outside of the land of Israel during the vision. Some Bible prophecy teachers like Dr. Arnold Fruchtenbaum, Dr. David Reagan and myself conclude that Ezekiel’s dry bones vision pictures the Jewish condition at the conclusion of their Diaspora, and that Hitler’s holocaust caused their ultimate condition of hopelessness. Thus, Ezekiel sums up the metric of time that the Jews would be without a homeland, not in years, decades, or centuries, but in their helpless concluding condition. (This above is a private video, which apart from this article is not to be shared). The ongoing Arab – Israeli conflict has forced Israel to form a great army. The Israeli Defense Forces (I.D.F.) has had to become the superior military in the Middle East as a matter of national survival. In my book and DVD entitled, Psalm 83: The Missing Prophecy Revealed, How Israel Becomes the Next Middle East Superpower, I devote an entire section to the existence of today’s I.D.F. in fulfillment of bible prophecy. In addition to Ezekiel 37:10, prophecies written in Isaiah 11, Jeremiah 49, Obadiah, Ezekiel 25, Zechariah 12 and elsewhere also seem to identify today’s I.D.F. Below are a few examples of what appears to be alluding to what today’s IDF will be soon accomplishing. The ancient Edomites have ethnical representation within the Palestinians today. I point this out in the Psalm 83 book within the chapter called, ‘Whodomites: Who Are the Edomites Today.” Another IDF vs Palestinians prophecy is in Obadiah. These are just a few prophecies that predict the IDF will defeat their Arab foes. These battles seem to be part of the larger prophecy in Psalm 83, which predicts how the modern-day Arab-Israel conflict will conclude. According to the Bible, it won’t be land for peace deals or two-state solutions, rather it will be an epic war in which the IDF will prevail. Based upon the above premises, the remainder of this article discusses the debate among scholars as to whether Ezekiel 37:10 describes an exceedingly great army or not. Some bible teachers, like Joel Rosenberg and me, believe Ezekiel describes an army, whereas other’s like, Dr. Thomas Ice and Ray Gano believe Ezekiel is predicting a great multitude or host will emerge out of the dry bones. Point 1 - The Hebrew word Ezekiel uses in verse 10 for army is, “chayil” and it is used 12 times elsewhere by Ezekiel and over 225 times throughout the Old Testament. All of Ezekiel’s usages and many Old Testament renderings clearly depict it as either an army, or riches acquired via the spoils obtained by an army, in the aftermath of a war. Nowhere else in the book of Ezekiel can it possibly be translated as a multitude or host. This establishes precedent that an army rather than a multitude is being described by Ezekiel. 8. Ezek. 38:4, 15 – predicting the coming armies of Gog of Magog. Point 2 - Further supporting the proper interpretation being an army, the following Bible translations interpret chayil to be an “army”: King James Version, New King James Version, American Standard Version, New American Standard Bible, New International Version, New Living Translation, New Century Version, and The Living Bible. Conversely, the Revised Standard Version translates the word as “host”. The New Revised Standard Version calls it a “multitude”. Conclusion - Obviously the above reasons overwhelmingly favor the interpretation of Ezekiel 37:10 as an army rather than a host or multitude. My Psalm 83 book points out that the purpose of this army is to protect Israel from its surrounding enemies who someday confederate in a final attempt to destroy the Jewish State of Israel according to Psalm 83. This statement is qualified by recognizing that the IDF is not part of prophecies related to Ezekiel 38 or the Armageddon Campaign of the Antichrist. 3. Armageddon – The Antichrist Genocidal Attempt of the Jews. ARE THE IDF INVOLVED IN EZEKIEL 38? The answer to this question appears to be NO! Psalm 83 and Ezekiel 38 seem to be distinctly different prophecies. 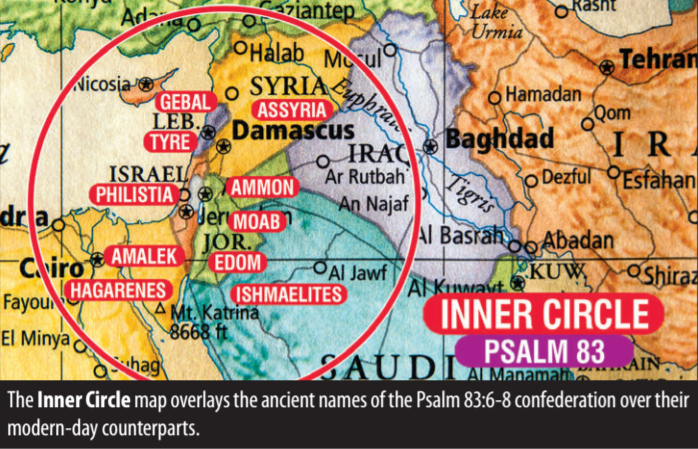 Psalm 83 involves an “Inner Circle” of Arab nations that share common borders with Israel. (see Inner Circle map image). They confederate in Psalm 83:5 to wipe Israel off the map as per Psalm 83:4. The goal of the confederacy is to take the Promised Land of Israel according to Psalm 83:12. The Inner Circle desires the creation of another Arab state, which would likely be called Palestine if it were to happen soon. The Israeli Defense Forces become the hand of God’s vengeance as per Psalm 83:9-11, Ezekiel 25:14 and the other prophetic references provided earlier. 2. Have never been Israel’s notorious enemies in comparison to the Psalm 83 current and historic enemies of Israel. 3. Do not share common borders with Israel. 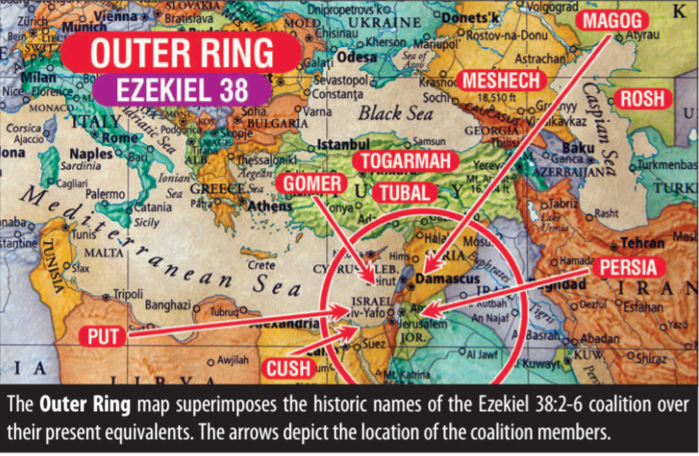 Unlike the Psalm 83 confederacy, the Ezekiel 38 coalition is a far to formidable foe for the IDF to fight alone. According to Ezekiel 38:18-23, the Lord supernaturally defeats the Outer Ring with an earthquake, great hailstones, flooding rains and fire and brimstone. All of this creates mass hysteria among the invading troupes who then turn against each other. The IDF does not appear to be involved in this battle. Some Bible teachers attempt to combine the Psalm 83 and Ezekiel 38 prophecies into one event, but the distinct differences, which are identified below, makes this highly improbable. 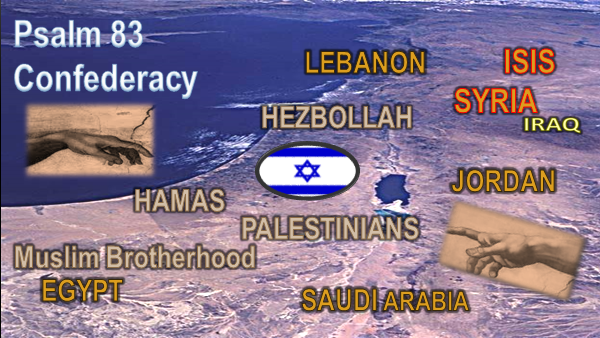 • Different Coalitions – Psalm 83 is an Inner Circle of Arab states, but Ezekiel 38 is an Outer Ring of countries. None of the Psalm 83 countries are specifically listed in the Ezekiel 38 prophecy. • Different Motives – Psalm 83 involves the destruction of the Jewish state in order to take over the land of Israel. However, Ezekiel 38 is about the pursuit of taking over Israel plunder and national booty. • Different Defeats – Psalm 83 is defeated by the IDF, but the Lord supernaturally destroys the Ezekiel 38 invaders. • Different results – In the aftermath of Psalm 83, the ancient Arab hatred of the Jews ends and Israel can expand territorially and, at least temporarily, dwell securely in the Middle East. According to Ezekiel 39:7, the purpose of defeating Gog and his coalition is to notify the world that the God of the Bible is the one true God! ARE THE IDF INVOLVED IN THE ARMAGEDDON CAMPAIGN? The answer to this question also appears to be NO! The Armageddon campaign is stopped by Jesus Christ single-handedly. This happens at the Second Coming of Christ. The fact that Christ goes it alone is detailed below. As these Isaiah verses clearly point out, the IDF is not involved in the defeat of the Antichrist and his armies involved in the Armageddon campaign. Nor, are the IDF playing an instrumental role in the defeat of the Ezekiel 38 invaders. Thus, we can safely conclude that a primary purpose of the role of Today’s IDF in Bible prophecy is to defend the nation against the final Arab-Israeli war predicted in Psalm 83. Considering what we see taking place in the Middle East today, I believe the Psalm 83 Arab-Israeli war could occur soon, and that today’s I.D.F. is fit for the challenge. 3. The “America and the Coming Mideast Wars” DVD, which explains America’s role in the Psalm 83 and Ezekiel 38 prophetic wars. *Products are also available individually.